In our busy time our kids live in a hurry-up world of busy parents, competitive sports, school pressures, malls, video games, incessant lessons and many more. We normally do not think these impacts as stressful for our children. The rushing pace of our kids’ lives can have an extreme effect on their natural joy. Yoga teachers found that practice yoga can help to overcome these pressures. 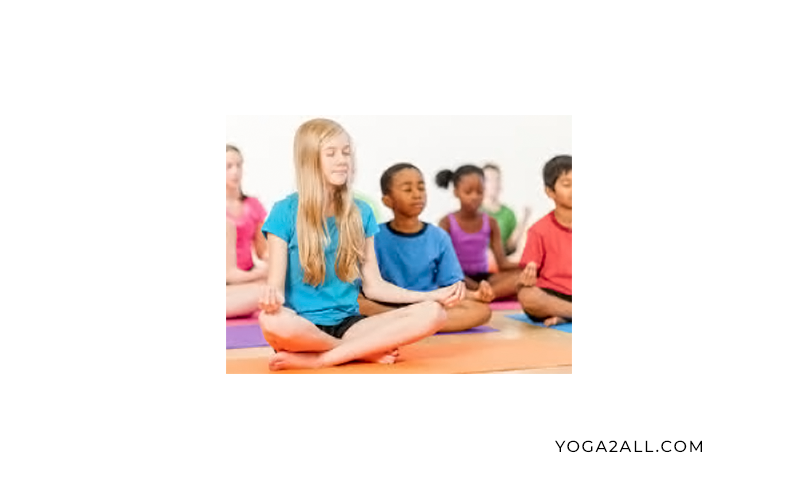 Whether children learn various techniques of yoga, they not only get the benefits of self-health and relaxation but also get the result of their inner fulfillment. Helps your kid to bend down on the ground and try to balance on the toes, knee should spread wide and the hands on the ground in between the legs. Look upward and start inhaling. As your kid starts exhaling, tell him or her to straighten the legs and lower the head towards the knees. Now return to the down bending position and repeat. Benefits: This yoga pose helps your child to tones legs, helps to improve heart –health and increases the flexibility of the hamstring. Help your kids to exhale and bring the right knee in front of the hands. As he or she lower the tailbone to the ground, help him or he to bend the knee to touch the right hand and try to bring the ankle ahead to touch the left hand. Now keep the left leg bent at the back. Now tell your kid to bring the left hand at the back and help him or her to place it on the left ankle. Tell him or her to inhale properly and reach the right hand direction to the sky. Now look to the finger tips. Help your kid to return to table pose, after than rest on the child pose. Encourage him or her for repeating on the opposite side. Tip for this pose: This is an advanced yoga pose / asana. Kids can stop this pose at any step, because this pose can be quite difficult to practice at the very first moment but when you kid will feel comfortable to practice this advance pose he or she can do. Encourage your kid to start breathing, and you can inspire your kid to have kids sing like a mermaid while looking at their fingertips. Help your kid to start mountain pose first and then extend the arms out to any side. When your he or she feels balanced, tell him or her to exhale and lean forward, and help him or her to left one leg straight enough at the back side. Hold in this pose and return back the leg to the floor and arms to the sides. Encourage your kid to practice this with the opposite leg. Benefits: This pose helps your kid to calms in mind and body and also helps in relieving stress and relaxation. Tip for this pose: Encourage your child to breathe properly, and indulge him or her to make airplane noises or you can inspire him or her about airplane that they are flying. Help your kid to sit with the legs crossed. As he or she inhale and bring the palms together, tell to push both of the hands against each other and try to straighten the back and allow closing the eyes. Now hold on this position for a few seconds and breathe deeply. Help your kid to sit on the ground with the back, tell him or her to keep the back straight and the bottoms of the feet together, so that he or she can place the hands below the ankles. Now exhale and try to lift the feet off the ground, keep your back and knees wide and straight. Encourage your kid to raise both of the hands over his or her head. Now tell him or her to drop one hand by the side and exhale, simultaneously arch the other over the body. Stay in this position for a few seconds and repeat for the other side. This can also be done as a standing pose. Tip: Always encourage your child for breathing and holding the posture, you can also encourage your kid to recite the colors of the rainbow while on each side. Benefits of Rainbow Pose: This pose stretches the arms, spine and chest and also helpful in calming the mind. Help your child to start this yoga pose on the belly, with the hands by the body and palms up. Now tell him to exhale and bend the knees. Encourage him or her to reach back with the hands and take a hold of the ankles. Now tell your kid to inhale and lift the heels upward and the thighs should away from the ground. The chest of your kid will lift away from the ground. Gaze forward and encourage to stay in this position for a few seconds. Now tell him or her to release as he or she exhale. 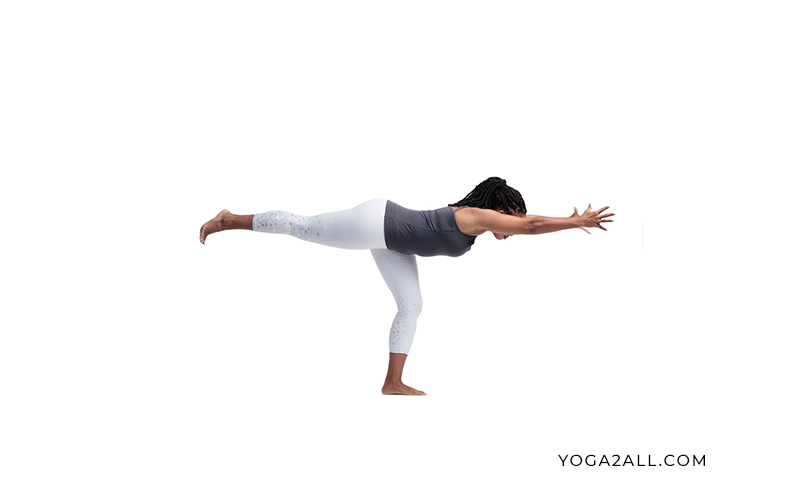 Benefits of Bow Pose: This yoga pose stretches the entire front of the body, and helps to strengthen the back muscles. The pose also improves posture. Encourage your kid to start in downward facing dog pose and lift one leg. Try to hold and then lower with an exhale. 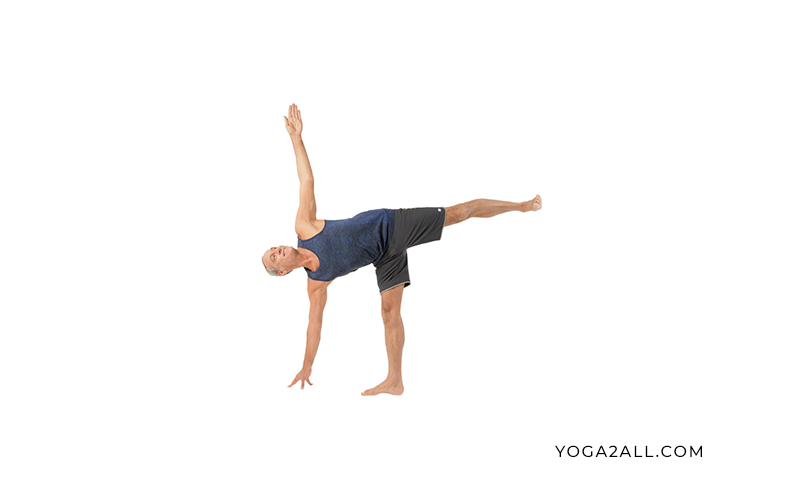 Repeat this pose with the opposite leg. Benefits of this pose: This pose calms the mind, relieves stress, anxiety and mild depression (if any), energizes your kid’s body, strengthen your child’s legs and arms, stretches the upper and lower parts of the body, relieves mental stress and headaches, good for back pain relief and fatigue. Encourage your child to start in mountain pose. Tell him or her to inhale and raise the hands over the head and try to push the palms together. Now exhale and tip the body to one side. Now inhale to return to the standing straight up and down. Tell him or her to repeat on the opposite side. Encourage him or her to exhale and lower the arms. Benefits: This pose helps to stretches the arms, spine, abdominals and chest. Helps to calm the mind. Lion pose specially designed for children. This pose has several health benefits. The pose is very good and easy to practice at any age of kids. This pose helps to stretches the hips, ankles and thighs and helpful in calming the mid, relieve stress. Help your kids to start on his or her knees and then sit back comfortably onto the heels. Now extend the fingers out and do press the palms into the knees. Encourage him or her to take a deep breath in through the nose. Now tell your kid to open the mouth and stretch out the tongue, tell him or her to open the eyes much wide and let the breath out from the mouth and ‘ROAR’ like a lion. Repeat this pose for a few times. Always try to encourage your kid to enjoy the pose like playing. Because kids do not know why they are doing this and what are the importance of yoga. Help your kid to start by sitting in the salutation seal. Say him or her to inhale as he or she brings the hands over the head. Encourage him or her to exhale as your kid slowly lower the hands to the sides, twinkling the fingers and repeat. Tip for shooting stars breathing exercise: The exercise helps your children to connect with others, as they send friendly wishes to those around them. To encourage breathing you can say your children to whisper the word wish, as they lower their arms. Benefits of this breathing exercise: This breathing exercise helps to calms your child’s mind and body, helps to relieve fatigue, headache, stress, insomnia, and god for mild depression. Encourage your kid to exhale and allow the knees to relax as his or her arms fall towards the ground. Now nod the head YES and then shake it NO. Now tell your kid to take a deep breaths tell him or her to allow the arms to sink closer to the ground. When your kid is ready, help him or her to roll back in the standing from, but slowly. Benefits of this pose: This pose or asana helps your child to stretches back and legs, good for relieving stress and calms the mind. Stand tall and reach your arms up to the sky. good post Kabbyik. Yoga is best form of exercise i believe.